This page provides information about Hacker Manufacturing. No sources for parts are known and will need to be fabricated. However, some owners of Hacker test presses owners are listed in the Hacker census. Hacker patents. 1914: Horace Hacker & Co. began as a reorganization of the A.F. Wanner Co. which made Potter and Poco presses. See profile of Horace W. Hacker. 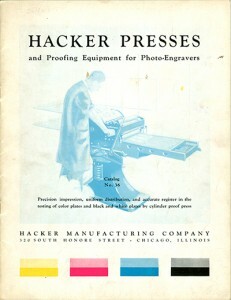 Vandercookpress.info is not legally affiliated with any owners of the names Challenge, Hacker, Poco, Potter or Vandercook.